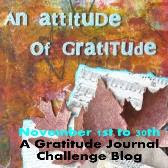 Thank you so much to everyone who has read this blog throughout November and to those who took part in whatever form. A special thank you to those who posted links to your blogs or flickr photos to share your work. It has been most enjoyable to see everyone's interpretation of the same verse or technique. Here is my page for November 22nd without the journaling covered over. I didn't want to advertise the fact that we were away so I covered up the journaling. Which leads me to my last thank you. A very, very special big thank you to BJ who added my linky every day whilst I was away. I really appreciated the fact that she did this for me so that it looked as though I was here at my house! If you would like to find out about where I was while I was away you can find out here.